Recently, there was some news that Medicare decided to enforce the medical doctors who accept medicare to use printers with their sterilizers. and before items are removed from the sterilizer, the operator should examine and interpret the chart or printout to verify that all cycle parameters were met and initial it to permit later identification of the operator (see 10.3.1 and 10.3.2). 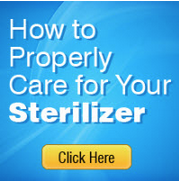 Sterilizers that do not have recording devices should not be used.